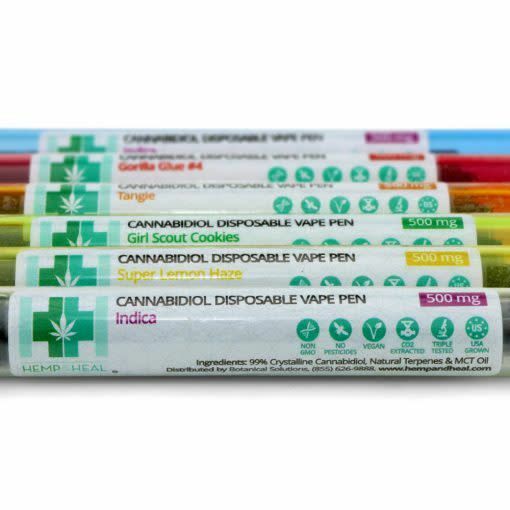 500mg Disposable Vaporizer Pen. 125 mg of 99% Crystalline Cannabidiol Grade A Pharmaceutical Hemp. CO2 Extracted. 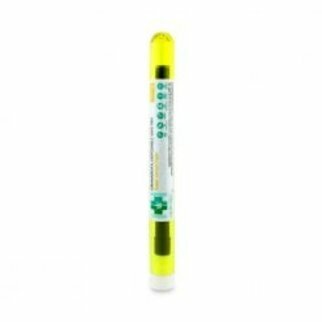 Hemp & Heal’s 500mg disposable vaporizer pen consists of 125mg of 99% Crystalline Cannabidiol Co2 Extracted Hemp Oil. It is mixed using MCT+Ce Liquid Emulsion with Medium Chain Triglycerides derived from coconuts (coconut oil). 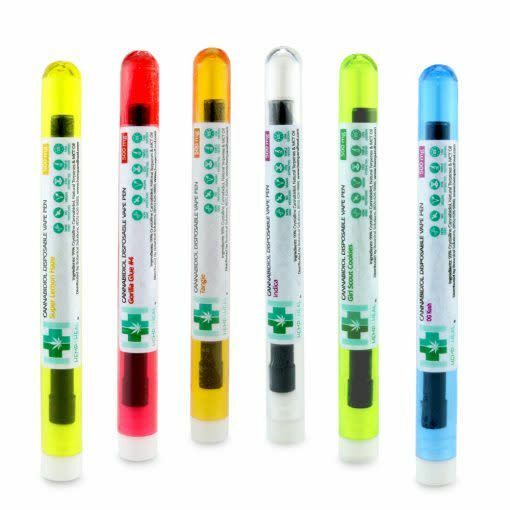 Hemp & Heal’s Terpene Infused Hemp Oil Disposable Vaporizer Pens are revolutionary disposable vaporizers designed to deliver the quality and integrity of your premium extracts. Incorporating the Reactor™ CCELL technology, it is a reinvented all-in-one with elite performance. 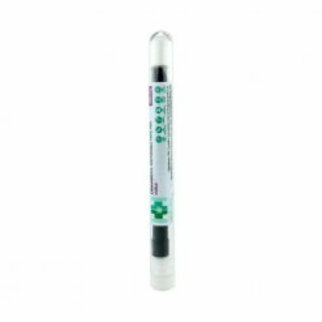 Maximized vapor production throughout the entire life of the battery, as well as maintains the intended flavor and efficacy. Hemp & Heal LLC supports the findings of the US Government in patent # 6630507 B1 “Cannabinoids as antioxidants and neuroprotectants,” which praises Cannabidiol for its antioxidant properties & US Government patent #20130059018 A1 “Phytocannabinoids in the treatment of cancer”. Antioxidants are vital to not only health maintenance, but also the prevention and maintenance of oxidation associated diseases such as Parkinson’s disease, autism, ADHD, Asperger’s, depression, Chronic fatigue syndrome, and some cancers. Hemp & Heal LLC also supports the further research into not only these areas but also into the additional therapeutic values of Cannabidiol. *Hemp & Heal LLC shall not be held liable for the medical claims made by customer testimonials. The statements made regarding these products have not been evaluated by the Food and Drug Administration. The efficacy of these products and the testimonials made have not been confirmed by FDA- approved research. These products are not intended to diagnose, treat, cure or prevent any disease. All information presented here is not meant as a substitute for or alternative to information from health care practitioners. Please consult your healthcare professional about potential interactions or other possible complications before using any product. The Federal Food, Drug, and Cosmetic Act requires this notice. These statements have not been evaluated by the Food and Drug Administration. These products are not intended to diagnose, treat, cure or prevent any disease or ailment. Hemp & Heal LLC assumes no responsibility for the improper use of these products. We recommend consulting with a qualified medical doctor or physician when preparing a treatment plan for any and all diseases or ailments. Hemp & Heal LLC does not make any health claims about our products and recommend consulting with a qualified medical doctor or physician prior to consuming our products or preparing a treatment plan. It is especially important for those who are pregnant, nursing, chronically ill, elderly or under the age of 18 to discuss the use of these products with a physician prior to consuming. You must be 18 years or older to visit this website and/or purchase Hemp & Heal LLC products. 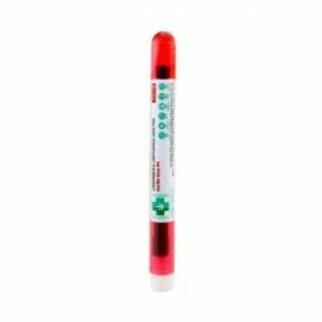 The information on our website is intended to provide general information regarding our products and is not to be construed as medical advice or instruction.